A new youth group plans direct action to challenge the influence of money on politics. The impact of the Supreme Court’s 2010 decision Citizens United v. the Federal Election Commission allowing unlimited and anonymous campaign spending has been profound and could yet be decisive in this election. With an estimated $9.8 billion set to be spent during this electoral cycle, the 2012 elections will be the most expensive in history and have completely saturated the media and cultural environment in so-called swing states. As a result, according to the 99Rise.org, “One in four Americans say they are less likely to vote than in 2008, and 75 percent of Americans believe money buys results in Congress. In response, 99Rise, a new grassroots group seeking to expose corporate spending in the most expensive election in United States history and get “big money out of politics” once and for all, has recently risen up. Coming out of the tradition of the Optor! movement in Serbia and the more recent Occupy protests in the US, 99Rise believes that strategic, nonviolent direct action is the only way to redress legislative loopholes that benefit profit over people. An example came on September 28 in Los Angeles and New York City when students and community members delivered petitions to both Chase and Bank of America demanding that the banks disclose their campaign spending. When the banks refused, the students vowed to return in greater numbers. 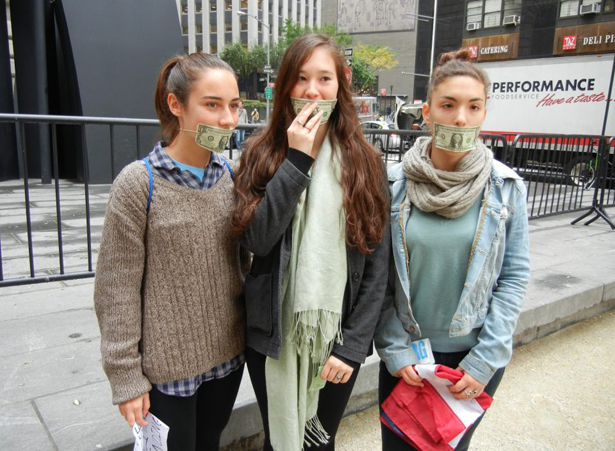 Recently, three high school students, Emilie Hirsch, Cai Oglesby and Danielle Raskin, followed up by sitting-in at JPMorgan Chase in lower Manhattan, demanding full disclosure of the bank’s anonymous political expenditures. Instead of engaging in any kind of dialogue with the peaceful young demonstrators, JP Morgan Chase officials instead chose to shut down the entire sixty-floor building and had the NYPD arrest them. The New York sit-in was followed by a similar action in Los Angeles, when another group of young people delivered the same petition making the same demand of another Wall Street bank. During the peaceful sit-in, five 99Risers were arrested after demanding that Citigroup fully disclose all “dark money” spending. According to Alex Stevens, an online organizer for 99Rise, the protest in Los Angeles was heavily policed but not violent. “A small group of cops had been stationed at the Staging Location watching us. Those risking arrest left for the undisclosed target in advance of the thirty or so supporters. A detachment of about a dozen officers on bikes emerged and tailed the thirty non-arrestable supporters from the staging location to the target,” said Stevens. “When we arrived, CitiGroup had already locked down the main entrance entirely and was refusing to accept the petition. Five activists sat down blocking the doors in front, the other supporters joined them.… Twelve cops formed a column just outside the area where activists and press were located. One officer declared the area an unlawful assembly, and a disperse order was issued.… the police surrounded those sitting-in, blocking them from view—they were then arrested one by one without much hassle and carted off in the paddy wagon.” Stevens also reported that the bail for each arrestee was set at $5,000. While the 2012 elections have shaped our political climate in the past months, 99Risers are planning to continue nonviolent actions against banks well beyond the election, promising the kind of mass mobilization that Occupy Wall Street attempted in 2011. Our generation needs to learn from the model of organizing that acknowledges the success of direct action and legislative pressure working in tandem in order to build a broad movement and put ourselves on the line, strategically, when and where it really counts.